Great home removalists require many attributes: physical strength & endurance, exceptional customer service and spatial awareness, but the most important skill of a Home Move removalist is that ‘care factor’. We filter through dozens of resumes to find one perfect applicant. Yes, we are kind of fussy! We make sure we hire the best people and train them to be the best removalists for our customers. It has always been our mission to train our removalists to the highest standard in the industry. We didn’t find any training material available which really gave our movers the detailed knowledge that they required to make sure they always moved our customers as safely and efficiently as possible. As a result, we set about creating our own Training program and tools. Vlad and Brett (with over 30 years of removal experience between them) undertook an ambitious task of deconstructing the science and art of home removals. To put it simply we believe we have created The Ultimate System for turning mere mortals into HomeMove Heroes. Our Melbourne removalists are capable of handling anything a home removal throws at them including furniture removal, piano removals and fragile removals. The most important thing is that our removalists spend weeks on the job, getting first-hand experience under the guidance of our training manager, Brett Anderson, who has over 17 years of invaluable industry experience and knowledge to pass down to the next generation of HomeMove Heroes. This ensures our service is consistently excellent, regardless of who’s on the job. It means that the safety and wellbeing of Homemove employees are always looked after. 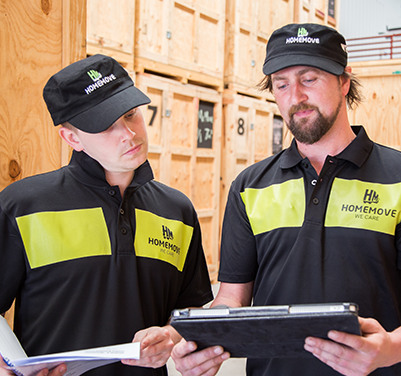 Our training philosophy is to educate and develop our movers in a positive and supportive environment, so they can represent HomeMove in a professional and confident manner. Our comprehensive training program allows us to confidently make the bold HomeMove guarantees and promise you that our move will be the best you’ve ever had.